My transformer sunglasses - Getting where? One of my constant companions. I am forever in sunglasses. (Despite popular stereotype, the sun does shine in Scotland. Quite often actually.) It’s not that I’m perpetually battling a headache or hangover or something – I just hate squinting and eye strain. I’ll even wear them when there’s just glare and no actual sun. It’s a comfort thing. But I may as well look awesome while I’m at it. 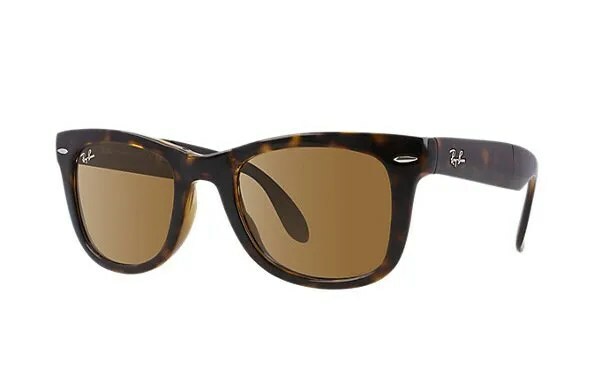 So about 2 years ago when my 29th was coming up and my parents asked me what I wanted, I’d been eying a pair of Ray-Ban folding Wayfarers for a while, and I said well, why not just update my 18th birthday present? Even if they last only half as long, I’d count that as a success. I was drawn to Wayfarers because they are a solid design classic. And my previous sunglasses were nice, but I don’t think they suited my face as well as the larger frames of the Wayfarer. I feel like a friggin’ rock star every time I wear them. An under-the-rader, rock star, not a look-at-me rock star. Just as I want it. But outside of that, there’s the most important and super awesome thing about them: they fold. 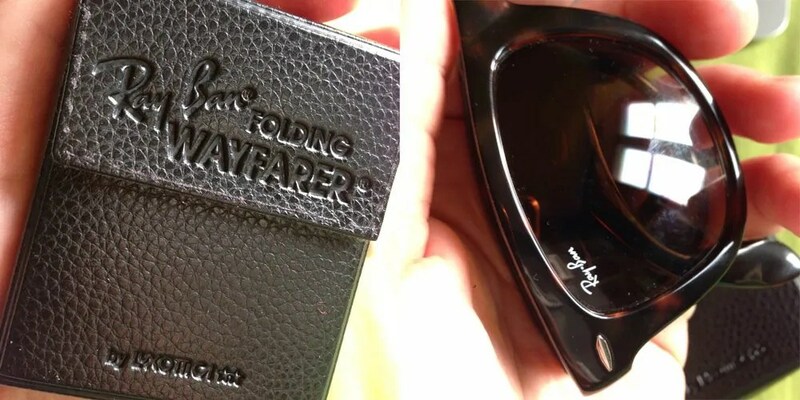 Not like normal sunglasses folding, like 5-point-transformer-fold-down-tiny folding. Into a lovely, compact square case that takes up barely any space in my bag. PERFECT for travel. And this is why I really love them. I hesitated to buy the folding version at first. More moving parts always means more potential to break, and I wanted these things to be in it for the decade-long-haul of my previous trusty shades. I expect a company like Ray-Ban should be making a high quality product, but still, you never know. So in the sunglasses bit of Jenner’s in Edinburgh, I asked the woman working there if she had much experience with the folding glasses (they also do Aviators that fold). In addition to a few anecdotes about friends who’ve had pairs with no problems for a year or two, she started to tell me a vague history of folding sunglasses. Apparently Ray-Bans were not the first to do folding, and some Italian company did them long ago. She sort of stopped herself, conscious that not everyone might want to geek out over sunglasses history (lady, I TOTALLY want to geek out about ANYTHING like that). I’ve since done some Googling on the subject, but with little to show, so I’m just gonna have to find myself another rogue sunglasses historian. In any case, I was suitably convinced to go for the transformers, by her enthusiasm if nothing else. And after having them 2 years, I see I needn’t have worried about quality. These things are great. And the foldy bits not only elicit awe (and occasionally even jealousy) from people who see me take them out or put them away, they don’t seem to make the glasses weaker in any way. When they’re on, you really can’t tell there are 3 extra joints, even though one of them is dead-centre of my face. And when they’re off, they are one of the most travel-friendly, packable things I have. So, if you want to feel and look like a classic badass (and be ‘practicably fabulous’, as claimed on the Ray-Ban website), I highly recommend folding sunglasses. They get so small you’ll have plenty of extra space for all the other crap you need that does not conveniently fold down to nothing.